Quarterly Subscription Box Curation Revealed! 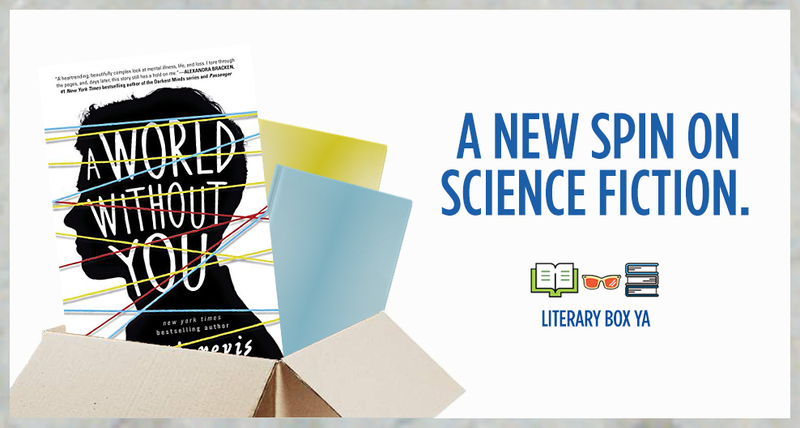 A few weeks ago, my editor told me that a subscription box was interested in featuring A World Without You in their next shipment. The wonderful people at Quarterly had noticed the book, and wanted to make a box themed around it. Here's the thing. I have this list of secret things I really, really hope will happen. One of those things has already happened this year (but I can't talk about it yet). So I sort of figured my good luck for this year had already been cashed in. Because one of the other things that I have secretly really hoped would happen? To be featured in a subscription box. I subscribe to a few boxes (including Quarterly's! ), and every time I see an unboxing online or get my own box, I wonder what it would be like to see my box inside a subscription box. And this July, I get to find out. 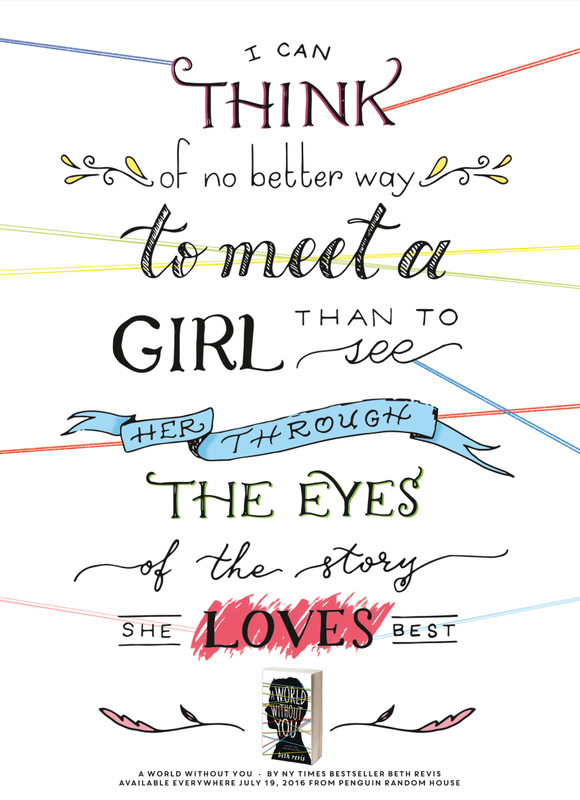 Quarterly's YA Literature box is just amazing, you guys. I've loved seeing how these boxes develop, and when Quarterly says I've curated it, they really mean it. This was not a casual thing. Every. Single. Item in the book, from the other books to the extra goodies, was picked through a careful selection process. I spent days looking for exactly the right items, developing the theme, selecting the other books. I wanted to pick books that fit with the theme, but that also were maybe not a title everyone had already heard of. I can't tell you what the other two books in the box are, but I can tell you that, like A World Without You, they are strange. Not everything is as it seems. There is sadness and hope and love and fear in all three books. They're not really science fiction, but they are weird. They each have a twist, or a new direction, or a surprise, or just something that's not quite right. And that's why I love them, and I think you will too. And the products that are being included with the box...I'm so excited about them that I actually ordered my own box so I could get them! The Quarterly people were such a dream to work with--they were the ones who hunted down something that had a little extra detail of wonderful when I couldn't find exactly what I was looking for. 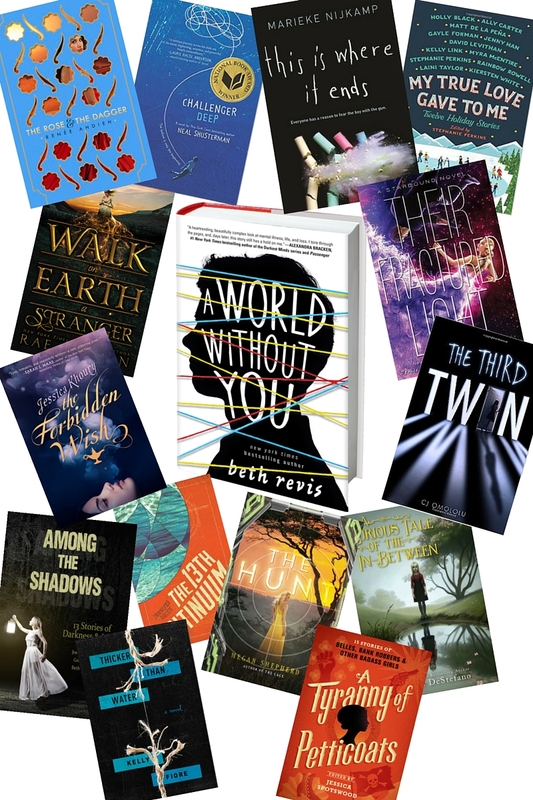 In additional to the goodies and the three books, I've worked hard with Quarterly to make A World Without You special for the box. There's a personal letter from me, describing the theme and why it means so much to me. 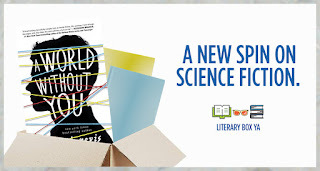 The books will come with a signed bookplate, and--this is really amazing--they're all annotated with 15 handwritten notes detailing hidden allusions, connections within the story, background on characters and more. It's basically like getting extras on a DVD. These annotations were my way of highlighting some of the most important scenes in the book, and pointing out stuff that is often ignored and hidden. I am so, so grateful to Quarterly for making this possible. 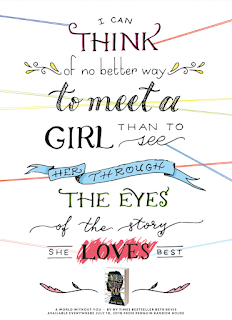 They've turned A World Without You from a book into an experience. And they've made sure that the boxes will ship on July 18th--so no one will have to wait and everyone will get the book when it's officially released! 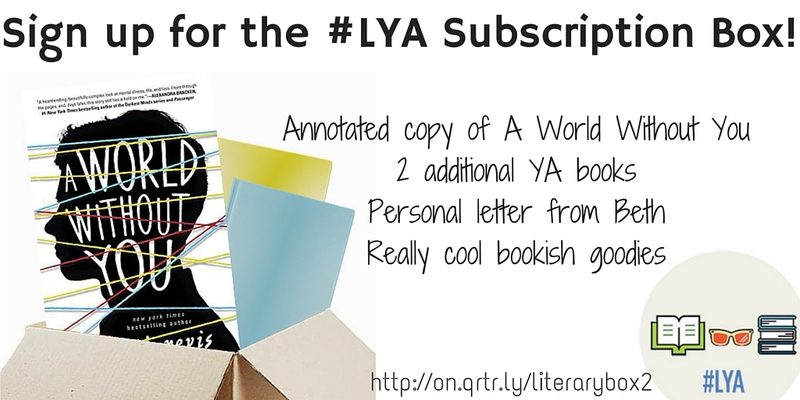 If you'd like to sign up for the Literary YA Box, all you have to do is click here (before they're sold out!). Your subscription will start with this box, and it's easy to cancel any time if you choose to do so. 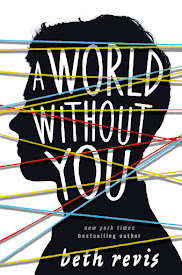 Get Signed copies of A WORLD WITHOUT YOU from 25 Bookstores Across America! Hey guys! Remember that time I asked you to vote on your favorite indie bookstores? And then I posted a lot of pics of me signing bookplates and art cards? Well, those two things are definitely connected! Here's what me and the fabulous people at Penguin/Razorbill have been working on! 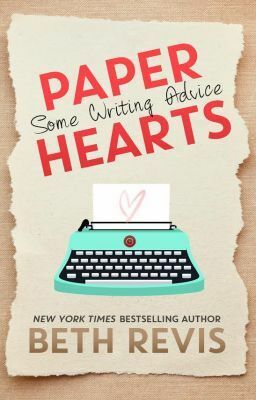 We ended up with such great bookstores on the list that we sent out these special packets to more than twenty-five stores, and if there's a store with more than one location (such as Vroman's or Books Inc.), these packets were sent to all locations. I was really happy to see so many bookstores from across the nation! And remember: Go into any of the above listed stores on July 19, and there will be signed copies of A World Without You ready for you to get! You absolutely can go in now and preorder your signed copy--in fact, I would love it if you did! Speaking of pre-ordering, if you can't get to one of these shops or want to take part in the special pre-order campaign at Malaprops, it's still open. You can find all the details about it here. ALSO: There's going to be a little contest going up on July 19th the involves you taking a picture inside a bookstore. I'm going to go ahead and say right now that a picture of the sign in the bookstore counts as an entry...and that there are more than 100 prizes up for grabs. So if you see the sign in your bookstore, take a picture of it and share it on social media! You'll already have a leg up on everyone else when the contest opens next month! Giveaway Round Up--Don't Miss These! In order to celebrate, I want to have a lot of giveaways--I've got to make room for new books and new swag, after all! 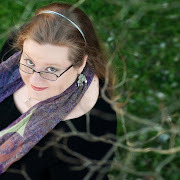 Before I get into the June giveaway round-up, I want to alert you to a few bigger giveaways and opportunities for free books that's ongoing. And I've been working with my friends over at YA Book Central, YA Interrobang, and Adventures in YA Publishing to do a few more giveaways this month and next, so be sure to be on the lookout there as well. I'll post on Twitter when those go live, but they're pretty epic, just fyi. So! Let's talk about June! I've got...so many...so many books to give away! I like to gather prizes, magpie-like, in preparation for launches, so I've been stockpiling for awhile. In the past, I would do one huge giveaway where one winner takes all, but I thought it might be fun to do something a bit different this time around. Throughout the month of June, I'm going to be hosting flash-giveaways on various social media outlets! These giveaways will be short--they'll run for just 24-48 hours or so--and super simple to enter. They'll be on all the social media platforms I'm active on, and it'll be as simple as follow + share or tag a friend in comments to enter. The giveaways will be international! Want to know what's up for grabs? Here's a sampling...but I may be adding a few surprise extras that only my followers will know about! And also--each book will come with a TON of extra swag for the winner from me and lots of other authors working to make this special! Hardcover of My True Love Gave to Me signed by Stephanie Perkins (editor) and also signed by almost all the authors in the anthology! How to win these books & more: follow me on social media! These flash giveaways will be sporadic surprises throughout the month of June, and the only way to win is to be following me! Most of the giveaways will happen on my Instagram, Twitter, and Facebook pages, but I'm reserving a few for other social medias, including Tumblr, my newsletter, YouTube, and my new fave, Periscope. Want to make sure you don't miss them? Then you better be following me! And to reward my longterm followers and the people who are the best (hint: it's you), I'm holding an extra giveaway right here. 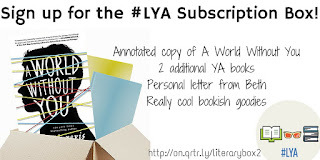 The prize is an ARC box full of all kinds of goodies, from a time turner like Hermione wore, to a custom journal from Icey Designs, to a Doctor Who magnet...oh yeah, and an art print and ARC of A World Without You! You can see more about the prize here. To enter for the big ARC box prize, just fill out the Rafflecopter below (open internationally). And to enter to win any of the books above, make sure you're following me online and prepared to click fast before the prize disappears!